Why You Plateau and Procrastinate and How to Solve it! How to do you master business, leadership, management, and your career? Why are you procrastinating and not motivated (hint –you’ve hit a plateau!) I show you the three pillars of mastery, along with how to apply it. You’ll see why 99% of people struggle and make zero progress. It’s pretty obvious once I draw it out why it is. And eventually why eventually every single person hits rock bottom and crashes/burns. You’ll get high-level tools to help you avoid this. 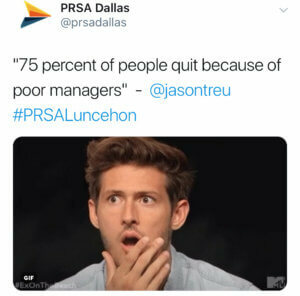 Check out my individual and group coaching options at https://jasontreu.com/services. You can try it out with a single coaching session as well. 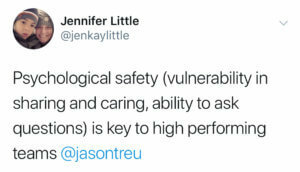 Maximize team performance (and all metrics) by getting people to care about each other. It trumps everything else. You can hire “b” players and be much farther ahead then if you have “A” players and people don’t care about each other. The fastest way to increase revenue, profit, and satisfaction isn’t through training it’s through better relationships. It starts with team building. 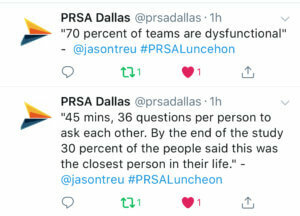 Get my free breakthrough game that 3,000 people and 50+ organizations (Google, Amazon, Microsoft, Oracle, PRSA Dallas, Interview Connections, etc.) are using, Cards Against Mundanity. It’s simple to play and comes with all the instructions. It takes five minutes to set up and delivers a huge ROI immediately afterward. 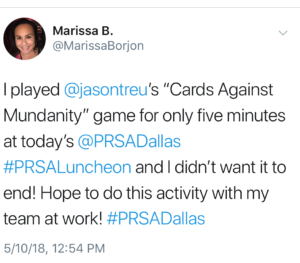 Here is my presentation at the PRSA Dallas May Event, “The Secret to Strong Teamwork and Collaboration that Leads to Innovation, Engagement, and Happiness.” We also played my game, Cards Against Mundanity. Collaboration is taking over the workplace. With employees spending more than half their time working together, teamwork is critical to organizational success and market leadership. However, according to Gallup, almost 70% of employees are disengaged and it’s costing U.S. businesses $550 billion every year. 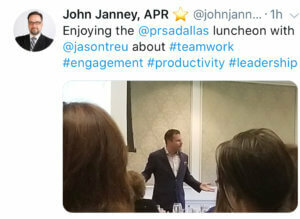 After spending three years interviewing more than a thousand individuals, including leaders and teams in Fortune and Forbes Top 10 Workplaces, Jason Treu has discovered specific strategies and activities any organization can do to quickly increase engagement and performance as well as work better with internal and external teams. 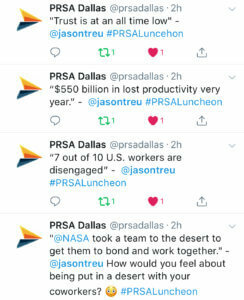 Join us for the PRSA Dallas May luncheon to hear how teambuilding and strong group connections can lead to productivity, exciting innovation and job happiness. 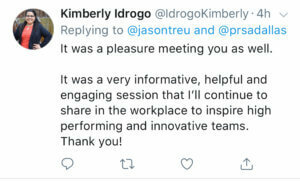 This session will help change and improve the way you work with any team and is ideal for any communication setting including agency, corporate, nonprofit, government and consultants.